In Ohariu it looks like a case of Shanks but no thanks. The sitting MP, UnitedFuture leader Peter Dunne, won a clear endorsement from National yesterday in the Wellington electorate after comments from National candidate Katrina Shanks suggested she would fight hard to win the seat. A Government source said Ms Shanks had subsequently been "pulled back into line" by the National leadership. With so many questions still hanging over Katrina and how Alex Fogerty,the white supremacist founding member of the anti-MMP group I outed last month, managed to become her electoral president for Ohariu, if I were Katrina, I'd be pretty quiet as well. Here's the problem for the mainstream media, National are panicking because they don't believe a word of the biased brainfart opinion polls the msm are using to declare National will win by nearly 60% of the vote. In a Parliament of 122 seats you would need 62 seats to govern. So National would not govern alone but could govern as National/ACT on 63 seats, National/ACT/United on 64 seats. But that is a whisker-thin majority. If the centre-right lose a couple more seats then the Maori Party would hold the balance of power, and there would be an auction for who gets to form government. ...the reality is that these mainstream telephone polls are deeply flawed, take Auckland as an example, 35% of households in Mangere and other south Auckland electorate's have LISTED landlines, 50% in Mt Albert and other isthmus electorates have LISTED landlines, close to 80% in most North Shore electorates have LISTED landlines. A decade ago those differences were less than 10% and all electorates had the majority of people on listed landlines, now they don't and you can easily see by that breakdown in Auckland alone how biased these cheap brainfart telephone polls can be. 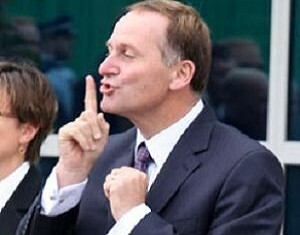 National realize this and are now desperately trying to ensure they have a coalition partner, that's the reason they are cutting deals in Epsom and Ohariu. If ACT continue to misfire with their jaw dropping outright racism that passes as publicity, National will be desperate for Dunne to win and the Maori Party to at least hold onto the seats it currently has. How likely will that be? With Mana running against the Maori Party, the chances of the Maori Party holding onto their present seats is incredibly unlikely and for Dunne, Ohariu has the largest percentage of Public Sector workers than any other electorate, those voters know a vote for Dunne is a vote for National and a vote for National is a vote for more public service cutbacks. Dunne is toast. So National realize the polls are flawed and are desperately attempting to shore up their coalition partners, because the mainstream media are so reliant however on these brainfart polls, they can't admit they are flawed and as such are blinded by National's sudden action on these fronts. Wasn't it hilarious that after all the attention given to TVNZ's poll that claimed Labour at their lowest support since 1500BC, how quiet the media were over the next poll that showed they weren't that far apart, or indeed the Horizon Poll that shows the left factions beating the right factions. The mainstream media are using these polls to manipulate public opinion, not reflect it. This election is far closer than the msm are pretending. UPDATE: Yawn. Slater is doing some song and dance routine on his site re my landline stats, firstly he's using 2006 data, I'm using 2008 listed landline data cited by lprent from the Standard. If Slater can't keep up with the latest trends and wants to back the deeply flawed methodology of his master David Farrar's cheap brainfart telephone polls, knock yourself out, but I won't be lectured on 'lying' from a convicted criminal like Cameron Slater. Bomber is talking about listed phone numbers – ie ones that are in the white pages. The reason for this being important is because even in Auckland 09 area there are only hundreds of thousands of households, 10 million possible phone numbers, and millions of numbers that are possible from the exchanges. Consequently random dialling is ineffective. Polling companies get listed phone numbers from white pages, or some other source of phone numbers. This is why having a unlisted landline number means I have no calls from either telemarketers or polling companies – except those that come from companies I have given my number to. Cameron is being an idiot (as usual) because he is obviously cannot read. His numbers refer to a question in the census. It does not look at listed land-lines in a household, or even land-lines in a household. The question is if they have access to a landline. This can be a landline next door or a phonebox on a street corner. The reason why bomber cannot provide a reference is because the data he is referring to is not published. It is the result of me writing electioneering software on a voluntary basis for the Labour party where I see the electoral roll matched to the white pages. When the question came up in discussions, I pulled some figures off a report I made prior to the last election about the issues with phone canvassing. It is from a combination of the electoral rolls and the white pages which is unique to political parties. There is no published information. However anyone who does have access to this kind of data for electorates for phone canvassing knows about this issue of diminishing numbers of households with listed phone lines. Goff also alluded to his confusion with the MSM polls when asked as well. He claimed Labour's polling showed them in considerably better position than the published polls. If Labour know this, I am sure the Nats know it too. What nobody knows is who is going to turn up on Nov 26. If I were Labour, i would be busily doorknocking in South and West Auckland now. additionally, in light of youth unemployment, what percentage of 18-25 yr olds who would historically have had their own "household" and "Landline" currently live in their family "household" and use mobile phones and laptops for their communication, not the family landline. And in light of their current plight and their very likely non existent presence in these polls, what impact does this have on the outcome. It's pure speculation of coarse, but I know a lot of twenty somethings living with their parents and they seem much more engaged in political debate than they were when they last voted for "Change". Their American Dream has plainly not been realized and the nine years of Labour which informed the bulk of their life currently seems like a very pleasant memory. I have a friend who is unemployed and has only a cellphone. Multiple him by a few tens of thousands and immediatly we start having a skewed result when it comes to phone polling. When I was a young lad, I had a part time job with MRL Research. We did DOOR-TO-DOOR polling, and in one instance, gave the respondent the option to declare their voting intention by secret ballot. They marked their party-of-choice on a paper; folded it; and placed it in a sealed bag which I couldn't open without damaging the seal. From what my supervisor later told me, it was quite an effective way to poll. The only way to determine how many households have landlines is to visit each house and ask. 1. Do you have a landline? 2. Who will you vote for (and offer the secret ballot option)? The results would be interesting to say the least.